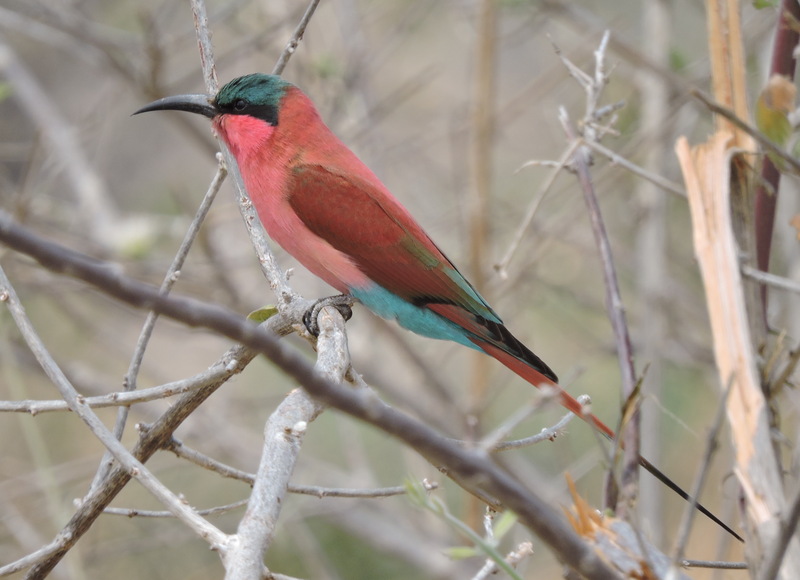 Chitake Springs are located in the southern part of Mana Pools National Park, about 50 km from the Zambezi river. During the rain the Chitake river flows into the Rukomechi river and the latter feeds the Zambezi. From the end of the rains in April these rivers dry up leaving only the springs as the sole source of water for a large area around them. The springs flow intermittently and at least once every 24 hours for some geological reason deep inside the earth. This natural wonder, therefore, attracts many animals both, prey and predators, from many kilometres around. As if this would not be a sufficient attraction, this general area has important deposits of dinosaur bones. In particular, fossils of Coelophysis rhodesiensis are present as well as mega-prints (90 cm in diametre!) of the herbivore Brachiosaurus aswell as Allosaurus‘s footprints. This is apparently important as it shows that the Chitake area was also an area of prey-predator interactions during the Jurassic period! As interesting as this may sound, we did not search for these but it may be the subject of another trip! We first learnt of Chitake through sad news. In late 2010 Pete Evershead was killed by lions while having a shower in the evening. Other friends that visited a couple of ears ago talked of animals walking very close from their roof tent. This left a very strong impression in them and they were very excited when they told us that they survived Chitake! We were fortunate to get a booking in Chitake 1 campsite, by the actual springs. As this is a wilderness area (not even the entry road to the springs is signposted!) 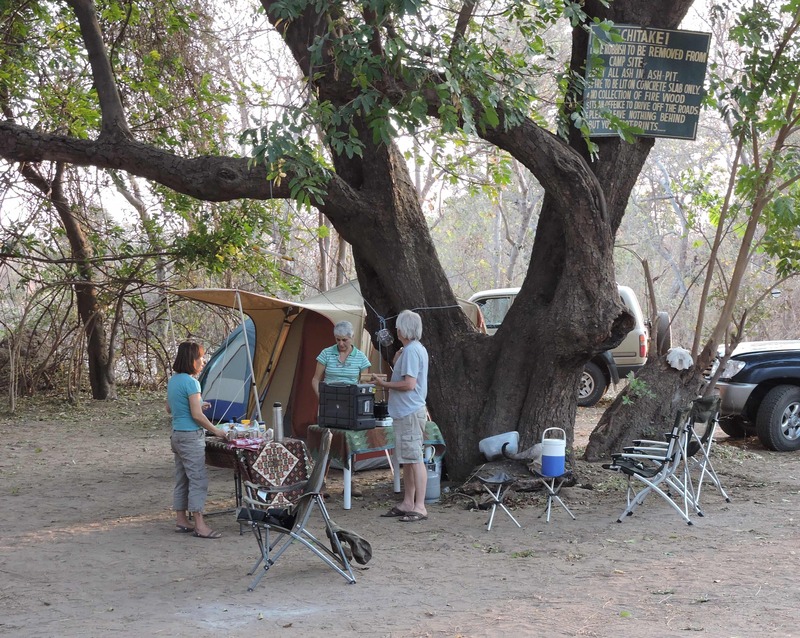 to camp there means to be on your own as there are only two campsites for private users in addition to one for tour operators. You also need to be self-sufficient in all needs, including water. There is only one track -the entry road- that extends to the baobab hill (where Chitake 2 campsite was before it was moved to a nearby place) so this is not a place for game drives but a true wild bush experience where you sit and wait for the animals to come to the water when it flows or you walk if you know what you do! Almost at the last minute we invited another couple to join us. Tom and Chizuki had never visited Chitake despite having lived in Zimbabwe from the late 90s so they seized the opportunity. They agreed with our idea of sleeping inside their car and we arranged to meet a couple of days before our departure to finalize the details. At that meeting it transpired that they could not convert their car into a bed so we all agreed to camp in the normal way. I was relieved as we have always slept in tents, even in places where animals were in large numbers in Kenya, reserving the car for “in extremis” situations… I will cover these in future posts. We arrived to Chitake in mid afternoon and set up camp early so we would be well prepared for the night, having the lions always in the back or our minds! After we were satisfied we explored our surroundings on foot and saw that the springs were about 100 metres from us and they were flowing.We sat in the dry river bed and waited. 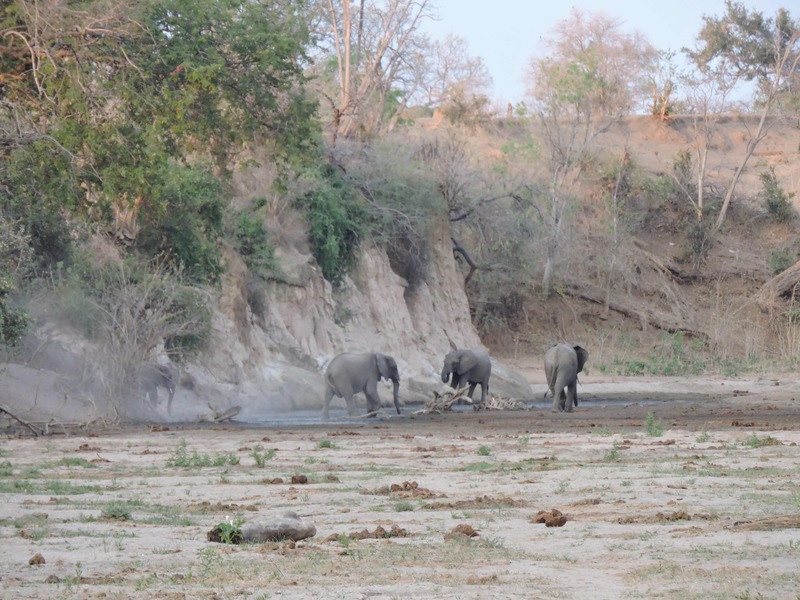 In one moment there was nothing at the water and then as if by a miracle, a group of elephants, buffalo or impala would be drinking! As night fell, the water was still flowing and the animals still coming down to drink. The elephants suddenly appeared (and disappeared!). After an early dinner we retired to our tents for a well deserved rest. Lions did roar as expected. They were far from us, probably following the buffalo some place else. We slept well, being careful when getting up for pit stops during the night. The morning after saw us all happy to see that the four of us survived our first night at Chitake and decided to celebrate this with a good -and healthy- breakfast! 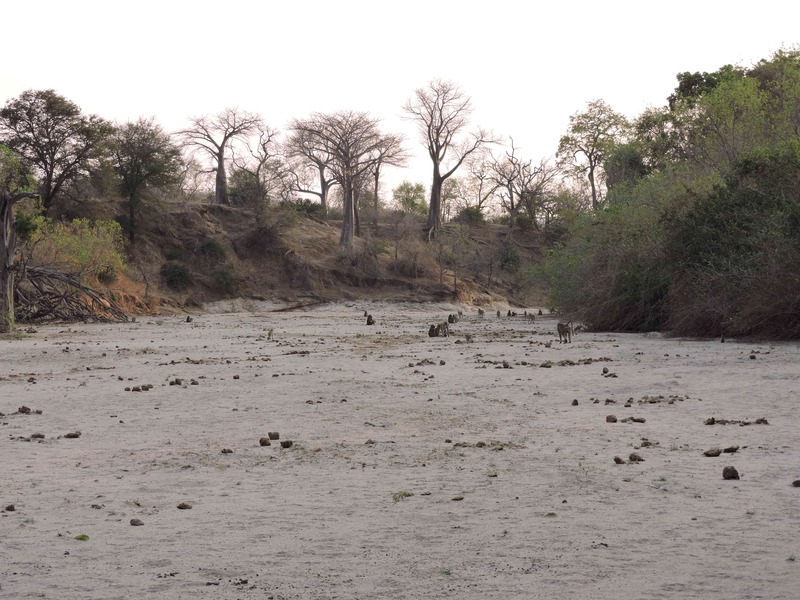 The water had stopped flowing during the night so only baboons were walking in the dry river bed. We decided that we would do a bit of exploring so we went to the actual springs where we could see a number of different footprints and a couple of carcasses (one buffalo and one elephant) that were responsible for the rotten smell that we could sometimes feel, depending on the wind direction. We then crossed the river and drove for a few km until reaching the baobab hill. After spending some time with the baobabs we returned, crossed the river again and drove on towards the exit as we had seen an open area where we thought cheetah may be found. We saw the usual warthogs and the ubiquitous impala. Then our friend Tom amazed us by spotting a painted/wild dog lying down at about 100 metres from the car! An amazing sighting. In fact there were three of them. Then he spotted a few more heads under another bush nearby! When the heads became full dogs, we realized that there were pups, six of them and half grown. At some point they all trotted towards the adults and the latter stood up for the usual greetings. We counted five adults and six pups. After their profuse greeting they all dashed off as if starting a hunt although we did not see any possible prey. We tried to follow them but lost them almost immediately. Giving up on the painted dogs we drove on to the junction with the main road and started going back to camp. The dogs were again at the same spot! Surprised we stopped to watch and confirmed that there were the same! While watching, again, all pups dashed off as if on a hunt, followed by one or two adults and, after a while, got back to the starting point. This exercise was repeated three times. The observation was a topic of discussion for a while as some thought it was a kind of hunting rehearsal while others -including myself- thought that the pups were just being either hungry or hyperactive! After that interesting encounter we got back to camp to face another night at Chitake, now more relaxed as we had survived the first! A “Chitake special”! 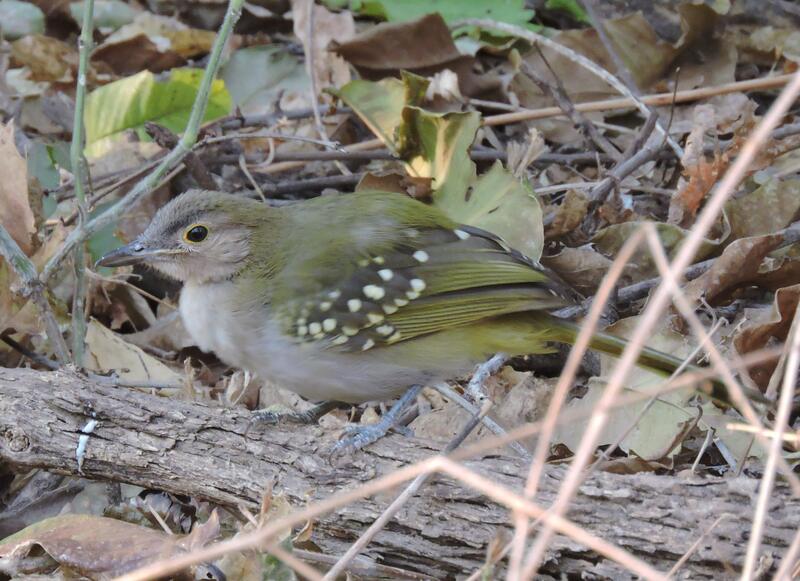 An Eastern Nicator looking for insects in the undergrowth.